In this Kyushu basho, was there any division other than sandanme, among the lower divisions? Judging by the huge number of young guns filling sumo�s fourth division, one might almost need to ask this question. Baruto, Kagaya, Kurazono, Kazafuzan, Yamamoto, Dewaotori, etc: all names of future sekitori prospects. The other divisions were almost entirely overshadowed, eclipsed by this mass of talent. Nevertheless�there were numerous surprises in the other divisions: in makushita as in sandanme, we saw the unexpected victory of an outsider. Unexpected, for sure, but they were wins for young talents, who we didn�t in fact expect to be as good as they were. And what about the jonokuchi division? Although this is the division in which we most often see the baptism of a novice, it was an experienced rikishi, returning from injury, who asserted himself. In summary, it was a mad, mad, mad basho in the lower divisions. And among those rikishi are those who clearly plan to prove that, even if Kotooshu and Kisenosato are no longer around, many young talents are there, about to challenge the stars of juryo and makuuchi! For the first time in many basho, the jonokuchi division was not won by a young and talented fighter making a fine start to his career as a rikishi. On the contrary, sumo�s bottom division was dominated by rikishi returning from injury. Three wrestlers very soon joined in combat for the yusho: Takanofuji (highest rank achieved: makushita 14), Tetsuhikari (highest rank: sandanme 12) and Asahisakari (highest rank: jonidan 25). Asahisakari had lost the jonokuchi yusho in a kettei-sen against Dewaotori last May. Takanofuji was a regular in the lower half of makushita division but in January 2004, he injured his right knee and ended up with just one win. He was absent after that for three basho, and returned for just one bout in September (which he won), to avoid falling off the banzuke. For his grand return to competition (he didn�t restart training until last September), Takanofuji didn�t meet any real opposition. 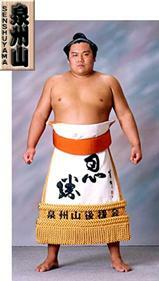 From the eleventh day, when he beat Asahisakari, he became the sole unbeaten rikishi in jonokuchi. He confirmed his title in the best possible manner by beating Morishita (from jonidan), who was in the yusho race in his own division! Behind Takanofuji, just 3 rikishi ended with 6 wins and a loss: Tetsuhikari (Jk35w), Asahisakari (Jk33e), Kai (Jk12w). It was a disastrous basho for Fukunokuni (Jk24w), who didn�t pick up a single win. Maekawa, the rikishi right at the bottom of the banzuke, and also the lightest at 68 kg, also finished with no wins and seven losses. Three deshi were considered to be favourites for this tournament in jonidan division: the Brazilian Takaazuma, formerly at Kinki university; Sugita, the jonokuchi division winner in the Aki basho; and another university graduate, Mizuguchi. Sugita, who had eliminated Takaazuma from the yusho race in his very first bout, strung together a series of wins to find himself at 6-0 on the 13th day. It was then that he failed against the excellent Kagaya, also at 6-0 but in sandanme. Mizuguchi, however, was unable to take advantage of this, also losing on the thirteenth day against the surprising Shima, despite a tsukiotoshi attempt. The latter, just 19 years old, and who made his debut at this year�s Hatsu basho, saw his fine initial climb up the ranks stopped by a fracture of his right leg in his second basho. He nevertheless returned with a flourish at the Aki basho, with an excellent 6-1. He is now really advancing with his first yusho, which will take him straight into sandanme division. In his own words, his strong point in this basho was his ability to concentrate on his pushing sumo without a mawashi grip (oshi-zumo) and his explosiveness at the tachi-ai. 14 rikishi finished with 6 wins and one loss: Takaazuma (Jd6e), Sugita (Jd6w), Takamisato (Jd20e), Oito (Jd22e), Mizuguchi (Jd30e), Asahanada (Jd35w), Yodonishiki (Jd38w), Wakakairiki (Jd54e), Tochitensho (Jd67e), Haruzakura (Jd85e), Saita (Jd89w), Morishita (Jd106w), Ryusei (Jd107w) and Sueta (Jd114w). The most disastrous performance was charged to the account of unlucky Kasachikara (Jd68w), no wins and seven losses. What talent we saw in sandanme division in this Kyushu basho! Some expected the unbeaten giant Estonian Baruto to win his third consecutive yusho, following two hands-down yusho victories in his first two tournaments � one in jonokuchi, and one in jonidan. Those people failed to take into account the wealth of young, ambitious deshi around him: in particular, the impressive college yokozuna Dewaotori, the former graduates of Nichidai (Satoyama, Kurazono and Yamamoto) and Toyodai (Kimurayama and Isobe) or even the Kazakh hope Kazafuzan. It was thus that Baruto suffered the first defeat of his professional career on the seventh day, against Kimurayama by oshidashi, thus ending his run of his first 17 professional bouts without a defeat. He even fell a second time in succession, against the experienced Brazilian Azumao, but even so managed to finish at 5-2. Kimurayama, who had in this way broken the Estonian�s superb winning run, continued his progress by beating the other phenomenon Dewaotori, before finally falling to Yamamoto. The latter thus finished at 7-0, after other convincing wins against Kokei and even Isobe. It still remained to see who would win the yusho kettei-sen against Kagaya, of whose extraordinary technique we already know (see also, among others, Le Monde du Sumo issue 1). This final for the yusho kept its promise, being truly spectacular. However this was a one-off, with the spectacle not to be credited to little Kagaya�s creativity; quite the opposite, it was the exceptional power of Yamamoto which could be seen at work. He made certain of a solid mawashi grip and ended with a fantastic tsuridashi, literally carrying his opponent out of the dohyo! (see the bout as a series of still photos at the end of the article). Other than Kagaya and his 7-0, 9 rikishi finished with 6 wins and a single loss: Dewaotori (Sd6w), Miyamoto (Sd12w), Satoyama (Sd21e), Kimurayama (Sd35e), Kokei (Sd46w), Kamakura (Sd51e), Isobe (Sd55e), Minanosato (Sd76e) and Ryukiyama (Sd92w). Note also that the great prospects Baruto and Kurazono both ended with 5-2. The Kazakh Kazafuzan was unfortunately injured during the basho, and finished at 2-4-1. Huge under-performances for Ryujin (Sd62e) and Yuki (Sd94e): 0-7. Mihogaseki beya, lacking reliable sekitori since the retirement of Higonoumi and Hamanoshima, and despite the presence of Masutsuyoshi in its ranks, has recently recruited some deshi who should assure them of a bright future. In particular, it appears that the heya has a special relationship with the foremost university sumo club in the country, that of Nichidai (see the following article). Indeed, the excellent Shiraishi, Satoyama and Kurazono, formerly of Nichidai, have all now joined this heya. They have been producing brilliant results since the beginning of this year (which coincides with their professional debuts) and will be ranked in makushita on the next banzuke. The other grounds for optimism for the heya is the presence in its ranks of one of the biggest (in all senses of the word) current prospects in ozumo, the Estonian Baruto. If Mihogaseki oyakata manages to keep up the healthy competition, which seems to be the order of the day amongst his deshi, there is no doubt that some of them will be sekitori quite soon. General surprise in the makushita division! The basho seemed for a long while in fact to be guaranteed to one of the former sekitori: Asofuji, Daimanazuru (forever a makushita yusho hopeful), Nakao and Tochinohana all seemed at one time or other within reach of winning. And then � four rikishi came through with 5 wins and no losses: two ex-sekitori (Asofuji et Nakao), but also two young up and coming wrestlers: Asahimaru and Shiraishi. Two veritable semi-finals take shape as follows: Asofuji - Nakao and Asahimaru - Shiraishi. Asahimaru has already been within reach of being promoted to juryo, but dropped right down the banzuke following a serious injury. Following a comeback in January 2004, he has climbed back up the banzuke from the jonidan division (winning it twice along the way). Now he is at makushita 34 west. His loss against Shiraishi in the �youthful semi-final� pegs him back to a final score of 6-1, which nevertheless allows him to return to the top of makushita. By winning this �semi-final�, Shiraishi sets himself up as a candidate for the yusho, against Asofuji, conqueror on the same day of the veteran Nakao (3 basho in makuuchi, highest rank achieved: maegashira 12). Fighting in a yusho decider is a situation Shiraishi has been in before: last September, he met Onishi in a kettei-sen in sandanme division� and lost. This time he didn�t miss out and, by beating Asofuji, obtained the biggest title of his career. Shiraishi will be ranked high in the makushita division in January, and in a position to be promoted to juryo. This will be the first time in his career that he will spend two basho in the same division�This meteoric youngster of 23 has in fact lost just three bouts in his career to date! Behind Shiraishi, 7 rikishi finished with 6 wins and a loss: Nishikikaze (Ms48w), Asahimaru (Ms34w), Nodera (Ms30w), Fukuzono (Ms17e), Raiko (Ms16w), Maikaze (Ms5e) and Asofuji (Ms1w). Tough blow for Onishi: the former college yokozuna, after a faultless route up to now and his yusho in sandanme in September, had his first make-koshi (3 wins, 4 losses). His rank of makushita 11 was no doubt still a bit high for him. Takamifuji and Kanbayashi both made their debut in March 2004, and ended up with a make-koshi. Since then, Kanbayashi has had three kachi-koshi in a row. He did reasonably well in November, with a score of 4-3, at makushita 8 west. For the third lad, Nakano (who made his debut in May 2004), he produced only a �weak� 4-3, very disappointing given his rank... makushita 54 west. In contrast, several young Mongolians are currently proving themselves in makushita. This is true of Hoshihikari (79kg, with a career score of 98-70, Hakkaku beya), Sensho (85 kg, career record 88-65-1, Shikihide beya), and Hakuba (94 kg, career record 107-89-7, Michinoku beya). In a few more basho, they could easily come and play the spoiler near the top of the makushita division or in the juryo division. Five rikishi are going to be promoted to juryo following this Kyushu basho. For four of them, it will be a return to the salaried ranks. There will be just one shin-juryo this time. The lucky newcomer is Maikaze, from Oguruma beya. He is becoming a sekitori after 77 basho, which puts him 11th in terms of the greatest number of tournaments disputed before reaching juryo division. This rikishi of 28 is 1.79 m tall and 129 kg. He has 281 career wins, 239 losses (and 12 absences due to a quite serious injury which made him miss almost two basho). After this year�s Haru basho, his kachi-koshi at makushita 5 might have allowed him promotion, but in the end he failed by one place, then dropped a little down the hierarchy in subsequent basho. His excellent 6-1 (Ms5e) at Kyushu basho is enough this time. Asofuji (Ms1w, 6-1) and Sumanofuji (Ms3e, 5-2) are returning to juryo after only one basho in makushita. Daimanazuru (Ms2w, 4-3) has spent four basho in the antechamber of the salaried ranks. As for Senshuyama (Ms3w, 5-2), has �crossed the desert� the past year, spending all of 2004 in Ozumo�s third division. What Happened To The Shin-Juryo? The fine run of �kachi-koshi grand slams� achieved by shin-juryo in the last three basho ended in Kyushu this basho. The shin-juryo were not undeserving, but two of them ended with make-koshi nevertheless. Kotokasuga (J14e), who came through the first two thirds of the tournament brilliantly, ended in the worst fashion possible, with five consecutive losses (7-8); a single additional win would have been enough to hold him level. In the same way, Toyonokuni (J13e) will have a bad memory of his first basho as a sekitori; he also held up rather well for the first ten days (5-5), before collapsing at the end (6-9). Both of them will unfortunately be demoted to makushita. As for Tamaasuka (J12e), definitely the most promising of the three shin-juryo, we have already seen him, straight from his superb yusho in makushita at the Aki basho, following in the footsteps of other young prodigies recently promoted, such as Toyonoshima or Kotoshogiku. To start with, he will have just achieved his kachi-koshi (8-7), with an unbelievable, perfectly even run of wins and losses (a win on the first day, loss on the second, continuing this way up to a win on the fifteenth day)! Yamamoto is on the left at the tachi-ai, Kagaya on the right (1). At the start (2), Yamamoto produced a huge push to the light Kagaya, who withdrew (3), while shifting right to avoid it. This led Yamamoto to the right (4). Continuing his forward push, Yamamoto grabbed Kagaya's mawashi with his left hand and began to lift him (5). Pushed to the edge of the dohyo (6), Kagaya couldn't prevent Yamamoto from straightening him up. The latter then grabbed Kagaya's mawashi with his right hand, at Kagaya's back (7). Kagaya was then completely blocked, and Yamamoto lifted him quickly into the air (8), before putting him down (9) outside the dohyo (10), for the win and yusho!